Medyear elevates your healthcare experience with your medical records and messaging in the palm of your hand. They collect and merge medical records from hundreds of health systems and over 700,000 doctors into a single, secure account. Patients can initiate secure chats with doctors and privately attach pieces of their medical history, as well as images, into a chart. What’s more is that Medyear is a HIPAA compliant cloud-based app, available in the app store. 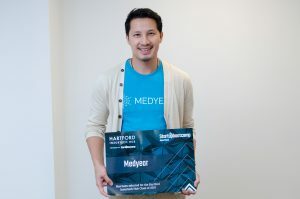 We’re finishing up our tenth week of the 2019 program and we had a chance to talk to Panya Chheng, Co-Founder, and CEO of Medyear. Panya talks about his journey through the cohort and his adventure as Medyear’s co-founder and CEO. Where did the idea for Medyear develop from? Around the time Facebook bought Instagram, I became obsessed with the influence of social networking in our lives. I was photo journaling my best life, hashtagging my thoughts, and reconnecting with high school classmates. Then, things took a turn for the worst. My dad was injured at work, and then I lost a series of aunts to cancer, one after another. Communicating with my dad’s providers and learning about my aunt’s medical history proved impossible at a distance. In my mind, social networking was the answer. As I started socializing this concept of a social network for healthcare, I got to know Dr. John Mattison, the Chief Medical Information Officer at Kaiser Permanente. John recommended that I read the book Connected, by Fowler and Christakis. In “Connected”, Fowler and Chistakis found that people were more likely to lose weight if their friends of friends lost weight. It turns out that human behavior is heavily influenced by a profound need to connect and share. And if there’s a social network for photos of your dinner, or for sharing political memes, then why not for healthcare as well? And I wasn’t the only one thinking this. Mark Scrimshire, Medyear’s co-founder, was giving a talk at a healthcare conference that imagined a world in which we used Facebook for managing our healthcare. After his talk, I approached him and asked if he’d join my company? He said yes, and then we spent the next 6 years building a healthcare social network. Why did you choose the name ‘Medyear’? As a unit of measurement, a Med-year represents one’s medical activity in a given year. Imagine you’re at the doctor’s office and he or she says “let’s take a look at your 2018 and 2017 Medyears”. Or you’re sick and you need to figure out what medicine you were taking in 2012, so you pull the app and scroll back throughout the Medyears. It’s like a trip down memory lane. Injured workers, people with 5 or more chronic diseases, digital nomads, and tech-savvy insurance/healthcare professionals. What do you think has been Medyear’s biggest obstacle, and how have you overcome that? For the first 4 years of operation, there was no established way to retrieve digital medical records into our platform. The healthcare industry was still debating standards and frameworks, and whether people even cared to have their records. And with no records to power patient-doctor communications, our brilliant little social network that was built to efficiently share medical records couldn’t do its primary job. To overcome this, we lobbied Congress. On Capitol Hill, we demonstrated to lawmakers how hospitals could share digital records into our app. We proved to Congress that consumer records exchange was technologically possible. Also, we threw our support behind the bipartisan health reform known as the 21st Century Cures Act, which contemplated mandating patient access to their digital medical records. Then, in 2016, the 21st Century Cures Act was passed and signed into law by President Obama, just before he left office. The Cures Act made digital records access for consumers the law of the land. Now, our social network has something meaningful and real to talk about. How do you think Medyear is going to change the insurtech industry? I think Medyear will establish a class of startups that merge both health tech and insurtech. To me, this is already obvious since health insurance, worker’s comp insurance, and life insurance pay for healthcare services, in varying degrees. These days, insurance companies want to do right by their customers and give them an amazing customer experience. But they were previously hamstrung by the healthcare industry’s inefficiencies and blockages in obtaining medical information about the insured. Now, by Medyear fixing the health data siloes problem, the insurers can realize their ideal of the elevated customer experience. Closing a deal with a large insurance company takes 18 months, on average. We wanted to shorten the deal cycle time. Getting from point A to point B faster is what acceleration is all about. I was poking around the internet and stumbled across your site and thought Hartford InsurTech Hub seemed like a good fit for our company. Amazing. The accelerator has poured an incredible amount of resources and support into our cohort, and I am grateful for it. Meanwhile, we are seeing results. Medyear just got its first enterprise customer a few days ago, so I can definitely say the program was worth it. Tell your story, not someone else’s. The fellow members of the cohort can become lifelong friends and also great business advisors. Take advantage of the support network and brilliant minds in the room.